It's almost coming up to 4 years since I first started my blog. Maybe I'm a tiny weeny bit too early to mention about it but I am too eager to share my thoughts for the day. 4 years isn't very long but in the four years I've had heaps of progress and change. All had been for the better of me and even if there are some unsolicited, they had been timely to my best interest. I will always be steadfast in my belief that progress means change and changes are good! But there is no such thing as by chance where the law of attraction is concerned. It had to be my own doing and by then it was too late to cry over spilled milk for all the nasty things that had happened. It was an awakening and it prompted a major shift in my life ... 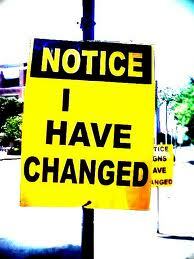 I changed! Blogging was the very first thing I undertook because I had wanted to share my learning experience about the law of attraction. At the same time it appeared to be a good avenue to make some side income for myself. After all I had always been playing with the idea to retire from the workforce by 45. However, I was already 45 and I was far from retiring as the pay pack was just too good to let go. Funny though, my career suddenly took a dive as I begin to experience changes in my perspective towards life. The oomph to remain on the rungs of the corporate ladder seemed to be fading fast and I finally called it quits at 46 ... well, a year later was still pretty close to target. Quitting spell some fear in my lo kong and myself as it meant changes to our expenses and existing commitments. We accommodated the changes as we move along and we coped well. On hindsight, early retirement was the best decision I've ever made and it certainly brought about change after change ... all the changes made a happier me. Unemployed now, I went into full-time blogging which enable various money-making opportunities. With building confidence, I dabbled in writing and soon better paying opportunities did arrived at my door. Today I am enjoying the experience of ghostwriting a book and another possibility on the way. Being unemployed also mean I am free to travel and quite a bit I did this past year to places that I've always dreamed of going. More changes ... friends come and friends go. Good friends remained in touch eventhough distance and years may have kept us apart. New good friends added to the list while the superficial ones had to be let go after their true colors emerged. First there were two cars in our household. Then there were 3 as my son Nick turned a licensed driver. Then it became four temporarily before we had to let one that was quick becoming a junk. By tomorrow we will be back to 2 again since I have just received the vacant possession of my new condominium which only allows 2 parking bays. The delivery is 6 months earlier than as scheduled in the Sales & Purchase Agreement. No one's complaining. Two heads are definitely better than one as it must be because lo kong and I had poured in our eagerness together to quicken the completion. I am now eagerly looking forward to moving into my new humble abode. Hopefully, I will be celebrating X'mas there. I am thankful for the good and bad experiences as well as the good and bad individuals that have entered my life as they had prompted me to change and thankfully a change into someone I love!